I've noticed some new signs around Okinawa (the one pictured above is at the Tengan post office near Camp Courtney). 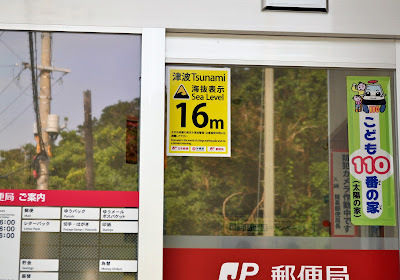 Although Okinawa barely felt the effects, the signs were prompted by the 2011 Tohoku earthquake and tsunami. Red signs are for water levels 5m and below, yellow are 6 to 19m, and blue are for 20m and above (approximately 16ft, 20ft to 62ft, and 66ft respectively. To give a little perspective, waves were measured at 10m (~33ft) at the Sendai Airport and the highest were almost 38m (~125ft) at Miyako. Water went up to 6 miles inland. While the Tohoku earthquake was an unprecedented magnitude, the following tsunami was not the largest in Japanese history. In fact, Japan averages one tsunami every 7 years. Being aware of your surroundings and knowing what to do in a tsunami definitely can't hurt (here's a guide from Kadena). I believe housing agencies are required to tell tenants if they're living in a tsunami zone, but just in case you're not sure what zone you're in, this guide has detailed maps of the island (pages 8-18).